Telangana TSGENCO Recruitment Notification for 12 Posts TSGENCO Recruitment | Recruitment of Telangana State Power Generation Corporation for 12 Posts Job details qualification and age limit | TSGENCO has released Recruitment Notification for certain posts on contract basis with CA/ICWA qualification This is really a good opportunity for the unemployed candidates and job aspirants of Telangana who are eagerly waiting for Telangana Govt Jobs and TSGENCO Recruitment 2016. Eligible candidates who are waiting for govt jobs in telangana and Telangana Electricity Jobs can get complete info from here. Job contenders who are having maximum age of 30 years are eligible to apply for these TSGENCO vacancies. All the applying job seekers must have completed their CA/ICWA with one year experience. Telangana State Power Generation Corporation Limited (TSGENCO) is one of the pivotal organizations of Telangana State, engaged in the generation of power with an installed capacity of 5045.6 MW. Officials of TSGENCO has invited online applications from potential aspirants for the posts of Management Trainee. 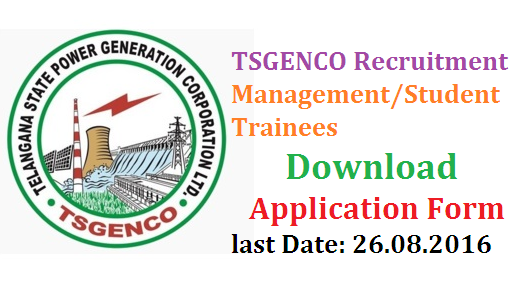 All the details about this TS Genco Recruitment 2016 like application, TSGENCO Apply Online, age limit, salary, educational qualifications, application process, selection process, etc. are provided in this post. Candidates selected shall be required to work at various Generating Stations of TSGENCO in Telangana state. Last date to apply : 26th August 2016. Educations Qualifications:Candidates should posses educational qualifications like CA/ICWA (Inter) from a recognized Institute with one year experience. Goto the official website www.tsgenco.gov.in. Goto recruitment/notification section and click on the notification link. Go through the original notification to get required information. Download the prescribed application form from the official website.